Coleman Powerhouse 2 Mantle Lantern Petrol Lamp. Power up to 175 watt. 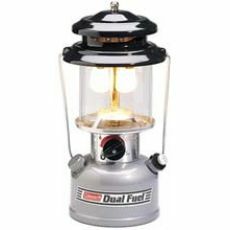 25% brighter than the standard Coleman 2 Mantle dual fuel lantern. 7-14 hours light from 0.95 litres of fuel. Fuel tank capacity 0.95 litres. Includes filter funnel to remove dirt and sediment from fuel.